how pretty! Love the vibrant colors! Love this! And the contrast with the polka dot envelope liner is gorgeous. I agree with paperella. That liner with the hot pink is stunning...and the black mat draws the whole thing together. This is a fabulous little combo. I, too, love flat note cards. I love making them for my girls to use as thank you notes--they are so quick and easy and fun. AND...my girls love them because they only have write just a couple of sentences and the card is filled up and looks great. what a beautiful note card Joan B! 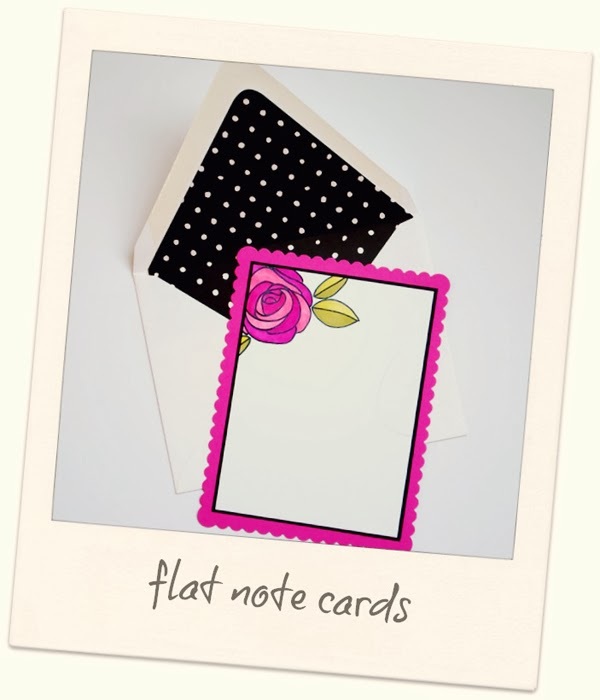 love the magenta with the black dotted paper and your pretty blossom stampings! I think I have some little scalloped notes - I've got to go search them out! Your card is lovely. I also love a flat card as well. Writing from the heart makes it so much more personal. Love the inside of your envelope flap too. I love the idea. I used to make sets of these now and then. I've always been drawn to pretty stationery. When I was younger, of course, letter writing was a big deal -- no email or cell phones or Facebook. I still like sending and receiving handwritten correspondence. I love how you colored the rose on this, and the colors are vibrant and cheerful. The envelope liner is outstanding with the notecard.